Edwardian elegance was in full vigor when the Pittsburgh and Lake Erie Railroad erected its terminus in Pittsburgh at the close of the 19th century. This was the age of the railroad barons, and the P&LE was in a mood to show off its wealth and prestige, especially in a city dominated by the Pennsylvania Railroad. In 1899, construction was begun on the south bank of the Monogahela River at the Smithfield St. Bridge for P&LE's station and trainshed at a cost of the then enormous sum of $750,000. The classically designed building's exterior is brick and terra-cotta tile in a light brown color. While the exterior is attractive, the truly amazing part of the P&LE station is its Baroque interior furnished in a richness of marble, gilt, mosaic and stained glass. A grand staircase descends from the Smithfield Street entrance to a waiting room that must have awed many a passenger. The interior is more akin to a grand European palace than to the grimy industrial city that was Pittsburgh at the turn of the century. After World War II, passenger service on the P&LE declined, as it did on almost all railroads. Amazingly, the P&LE terminal was kept intact. 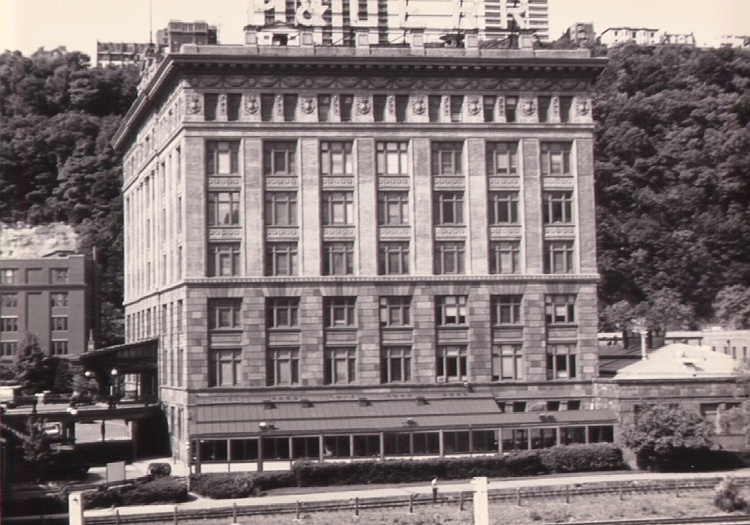 Pittsburgh, an enlightened city when it comes to saving its landmarks, began a restoration / reuse project, and in 1976 a reopened terminal was shown to the public. To the rear of the station, former freight houses have been converted into an upscale shopping mall. A posh restaurant, the Grand Concourse, occupies the former terminal waiting room areas. Tables can be had along the river which also overlooks the P&LE (now Conrail) trackage. One can dine in elegance at a genuine railroad terminal, watch trains, and river traffic and enjoy the Pittsburgh skyline view. A toast, Ladies and Gentlemen, to the Pittsburgh and Lake Erie Railroad! and may not be used without express permission of that owner.